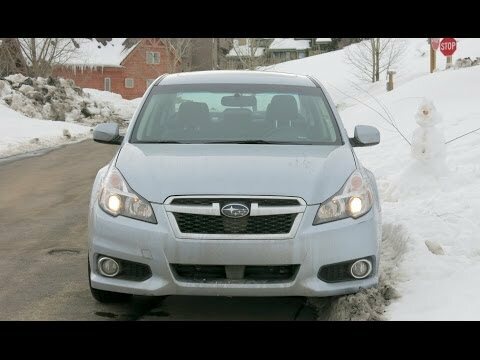 There isn't another car quite like the 2014 Subaru Legacy. As a roomy sedan, it's full-featured, about the same size as a Honda Accord or Toyota Camry, offers excellent resale value, has commendable safety ratings and is competitively priced, but its Symmetrical All-Wheel Drive gives it a capability the others just can't match. The most trustworthy, roomy, reliable, smooth riding, snow surviving, music blasting, efficient gas using car I have ever owned! I love my car! I live in Colorado and the snow can be really bad, but I always feel confident my car will be able to get out of any snowy situation I find myself in. I have yet to get stuck in the snow. it is such a comfortable drive. There is plenty of room for everyone including myself, passenger, and the backseat. My trunk is also huge. I can fit just about everything in there and you would never guess. Although the inside of the car feels huge, it is smaller and I don't get stuck in places I thought I would. there is bluetooth, which is essential, but I wish is connected automatically like my last car. The headlights are also a pain to change, but most cars are. The car is AWD, and I have a manual. Sure, stop and start traffic isn't easy, or fun, but car does well in winter weather, and the highway. The shift to 1st gear is a bit rough with the switch point, but other than that it's fine. I hardly ever hydroplane, or slide in bad weather, like I have other cars. It's roomy, and comfortable. The best bit being the dash display, and the meter that tells me how many more miles I can travel with how much gas I have left! Subaru Legacy: where I know I am safe. I have been driving a Subaru Legacy for a few years now and I would recommend one to anyone who is looking for a new car to buy. I drive an hour to and from work everyday and the seats are extremely comfortable. The air and heat turns on really fast and I have never had any problems with any of the features. The only thing that has bugged me is the AUX cord jack does not always work the way I want it to. Overall is a great car with a lot of great features. Subaru will notify owners, and dealers will replace the windshield wiper motor bottom cover assembly, free of charge. The recall began October 2016. Owners may contact Subaru customer service at 1-800-782-2783. Subaru's number for this recall is WTK-71. Note: This recall supersedes recall 11V-469. All vehicles that were remedied under that campaign are affected by this campaign, and need to have their wiper motor bottom cover replaced again.